A new image by project nightflight shows the new moon hanging over a sunset-lit cloud landscape, reminiscent of Bespin's Cloud City in the Star Wars universe, where Han Solo and Princess Leia stop for repairs during The Empire Strikes Back. This stunning view of an extremely young moon over a cloudy landscape may look like the Cloud City of Bespin from "Star Wars: The Empire Strikes Back," but it is a view that is completely real. 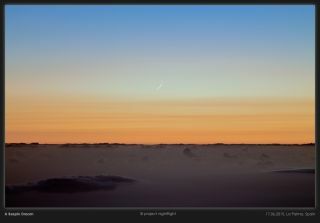 Project nightflight, an effort led by astrophotographers Karoline Mrazek and Erwin Matys to spur interest and conservation of the night sky, photographed the sliver of a new moon on the island of La Palma, Spain on June 17, and captured a setting straight out of science fiction for their latest image. The project's work is online at www.project-nightflight.net. But the view didn't last long: as the young moon slowly developed into a silvery crescent, they had only a few minutes to capture the scene using a high-dynamic-range camera technique to catch all the variations in light. "When we finally drove down the mountain, we discussed how much the scene had reminded us of George Lucas' Bespin Cloud City," the photographers said. "One of us even claimed to have seen the Millennium Falcon out of the corner of his eye." Editor's note: If you have an amazing photo of the moon, or any other night sky sight, and you'd like to share with Space.com for a story or a gallery, please send images and comments in to spacephotos@space.com.